Guys, MS back with his own style. Here is another android apps sharing blogspot template. 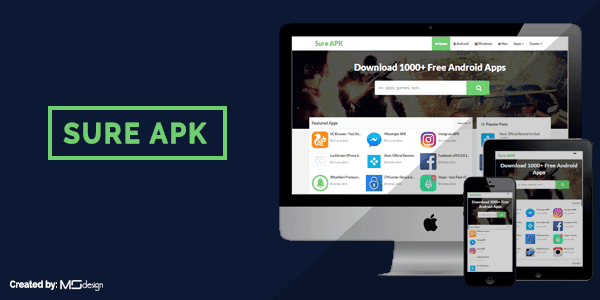 Sure APK is a responsive creative and fast loading blogger template. You know guys, msdesignbd always develop unique and creative blogger templates. Our last apps sharing template was Blue APK. After that, now we're sharing another template for who running a apk apps sharing blog with blogspot platform. You know, most of visitors are comes from mobile on that type of blog. So its become very important to use responsive and mobile friendly blogger template. Sure apk is pure and 100% responsive blogger template. That is compatible with all kind of smartphone device. Check here mobile friendly test report. Gambardi Related Posts: tidak keluar. solusi nya? How to remove footer link? This feature also available on free version. Check documentation and try again. You should buy full version for better work. You edited some codes on Template. Reinstall this again. Featured Posts Widgets by Label not working!! Can you show me? pleasezz!! font awesome is in template? Bro Great job. I found a blog who have many function? how can i get this function? it is paid version? Nice looking template and it has lot of features in it. all the best. Why only 13 item/label.I'm need 30 Item/label. Yeah im put 12 item/label to get best looking. Sorry vai, sob thik ache but amar ekhane sudhu page 1 e show korche porer page gulo show korche na page navigation e. Ki korbo vai? Please help me. If I buy the currency Indonesian Rupiah, roughly the price so how much? WOW, Duhh moment, I Need to read things. i need to keep the search bar and the image always on the top but when the post is opened so they are not shown can i do this stuff. I Bought your other other Good template. I can not put the posts in each section featured apps, featured games etc how do I do this? Thanks for the great list of templates. Very useful to me. Very informative post! Thanks for taking time to share this with us. Looking forward for more.